Molybdenum chemical properties in the air at room temperature are stable. When the temperature is higher than 400 ℃, there is slight oxidation. When the temperature is higher than 600 ℃, the metal will rapidly oxidize to molybdenum trioxide. When the temperature is higher than 700 ℃, the water vapor will oxidize Mo into MoO2. Molybdenum does not react with hydrogen even the temperature up to melting temperature. However, when molybdenum is heated in hydrogen, it can absorb a part of the hydrogen to form a solid solution. For example, at 1000 ℃, 100g molybdenum can absorb 0.5cm3 hydrogen, and at 300℃, hydrogen is absorbed by fine powder. 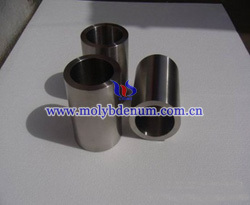 When the temperature is below 1500℃, molybdenum does not react with nitrogen. But when the temperature is higher than 1500℃, molybdenum reacts with nitrogen to form nitrides. If the nitrogen pressure is low, there will be no reaction between molybdenum and nitrogen. Carbon, hydrocarbons and carbon monoxide will react with molybdenum at 800℃ to produce molybdenum carbide (Mo2C). When the temperature is higher than 700℃ carbon dioxide will make molybdenum to oxidize. Fluorine can react with molybdenum at room temperature to form volatile molybdenum fluoride MoF6. Chlorine can react with molybdenum when the temperature is higher than 250℃ to generate volatile molybdenum chloride MoCl5. Iodine vapor does not react with molybdenum. Bromine reacts with molybdenum under light red heat. When moisture is present, all of the halogens can react with molybdenum at room temperature. Boron interacts with molybdenum in the presence of heat. Sulfur vapor will react with molybdenum at 440 ℃ or more, but hydrogen sulfide reacts with molybdenum when the temperature higher than 800 ℃to produce molybdenum disulfide (MoS2). Sulfur gas at 700 ~ 800 ℃ can also oxidize metal molybdenum. When the temperature is higher than 1200℃, molybdenum can react with silicon to form molybdenum disilicide (MoSi2), which is very stable in the air when the temperature rises to 1500℃. At room temperature, molybdenum in hydrochloric acid and sulfuric acid is stable, but heated to 80 ~ 100 ℃, molybdenum is slightly dissolved. Metal molybdenum at room temperature can be slowly dissolved in nitric acid and aqua regia and heating can accelerate the dissolution rate. Metal molybdenum will dissolve in hydrogen peroxide to generate hydrogen peroxide-H2MoO6 and H2Mo2O11. Molybdenum is stable in hydrofluoric acid but dissolves rapidly in a mixed liquor of hydrofluoric acid and nitric acid. When the volume ratio of nitric acid, sulfuric acid, and water is 5: 3: 2, the mixture can be used as molybdenum dissolved agent. The molybdenum core winded on the tungsten wire dissolved with this mixture. Molybdenum in the alkali solution at room temperature is stable and in the hot alkaline solution will be slightly corrosive. Molten alkali can strongly oxidize the metal molybdenum. If oxidizer exists, the oxidation degree of molybdenum is more intense to form molybdate.